Medical service fees are defined as the fees received by a medical facility or pharmacy in exchange for insured medical services or products provided to an insured person. These fees are overseen by the Ministry of Health, Labour, and Welfare (MHLW), which sets the fee schedule and determines the billing conditions for medical services, medical devices, and pharmaceuticals all providers must adhere to. There are prohibitions against setting fees higher than those in the fee schedule and providers are restricted from combining non-listed services and products with listed ones, with very few exceptions. Mixed medical care series (MMS or kongo shinryo) is currently being introduced and further exceptions to these restrictions are expected in 2016. Since the system was established in its current form in 1961, healthcare fees have been administered on a fee-for-service (FFS) basis. When a service, pharmaceutical product or medical device is provided through the insurance system, the provider calculates reimbursements based on the number of points allocated for each item. The provider is then reimbursed for the service or product based upon the number of points. Similar to the diagnosis related groups (DRG) prospective payment system (PPS) found in the U.S., DPC is prospective and uses codes based on diagnosis categories and diagnosis groups. As of April 2012, there were 2,927 DPC codes. The unique part of this payment system, however, is that it is per-diem and integrates standard FFS payments. Providers are paid a flat-rate prospective fee per day of inpatient hospital stay for certain DPC services and paid FFS for non-DPC services. Do not cover surgery, radiation therapy, anesthesia, and medical treatments valued at more than 1,000 points. These instead are paid FFS. Differ according to hospitalization stage. Per-day payments for the first stage are higher than the latter two stages. The second stage lasts until the average length of stay and per-day payments within this stage are set lower effectively neutralizing the higher payment provided in the first stage. Per-day payments for hospitalization within the third and last stage are lower than the payment rates of the second stage. If length of stay becomes exceptionally extended, all payments become FFS. What is the specified period of hospital stay? 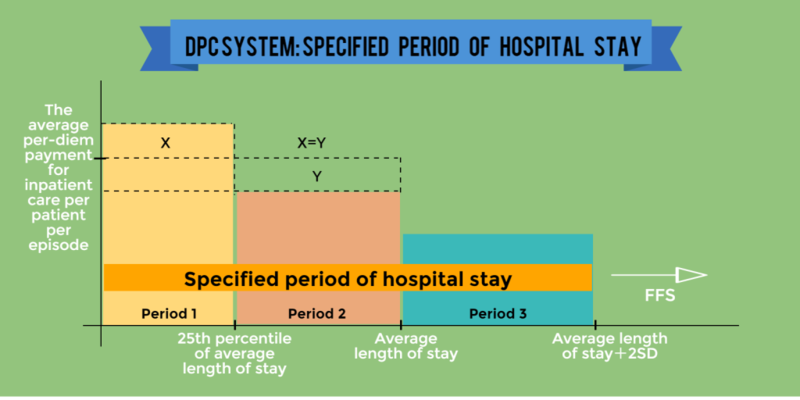 The specified period of hospital stay divides a hospital stay into three periods. Period 1 refers to the length of time equal to the 25th percentile of the average length of stay (ALS) for the specific episode. Period 2 extends from the 25th percentile to the ALS. Period 3 begins after the patient remains in the hospital after the ALS and lasts until a period equal to the ALS plus 2 standard deviations. Under the DPC system, after a patient exits period 3 and leaves the specified period of hospital stay, medical expenses are reimbursed fee-for-service. See figure below. Has episode-based payment resulted in lower costs? Another goal of the Japanese system of episode-based payment was to drive down costs, but is that goal being achieved? Actually, there is a possibility that health care costs have increased as a result of DPC. While DPC was successful in reducing the average length of hospital stay, an increase in the per-diem rate of inpatient care created an incentive for hospitals to increase the number of inpatients. The introduction of DPC also saw the start of “DPC consulting” services that, in some cases, help facilities manipulate coding, or up-code, in order to yield greater returns per patient.